Transmission or Cause: Cutaneous lymphoma is a type of skin cancer caused by cancerous skin lymphocytes, a type of white blood cell. Lymphoma can also occur in other places in the body such as lymph nodes, liver and spleen, but dogs with cutaneous lymphoma usually do not have lymphoma in other places. Sezary syndrome is a form of cutaneous lymphoma associated with the presence of cancerous lymphocytes in lymph nodes and bloodstream. 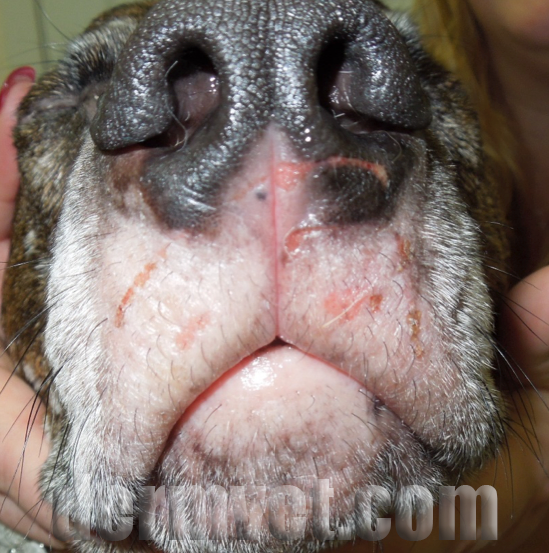 Affected Animals: Cutaneous lymphoma is rare and usually occurs in older dogs. Dogs with pre-existing allergies, Boxers, and Cocker spaniels may be predisposed. Clinical Signs: Symptoms can very variable, ranging from a red scaly rash which can be very itchy and mimic allergies, severe silvery scaling or skin nodules which can ulcerate, loss of pigment +/- crusting on the nose, lips and footpads, and/or severely red gums. Because cutaneous lymphoma can initially be very mild or complicate pre-existing allergies, in some cases it can slowly progress over months to years before diagnosis. Diagnosis: Diagnosis of cutaneous lymphoma is made by ruling our other causes of red scaly rash such as skin infections via skin scrapings/cytology for microscopic examination to look for infection and inflammatory or cancer suspect cells. Ultimately, the diagnosis is made by skin biopsies which should be sent to an experienced skin pathologist because, depending on the site biopsied and stage of disease, cutaneous lymphoma can sometimes appear similar to allergy or autoimmune disease on biopsies. Biopsies are also needed to differentiate cutaneous epitheliotropic lymphoma from non-epitheliotropic lymphoma which often involves internal organs and may be treated differently. Treatment: Localized lesions may be treated with surgical excision or radiation therapy, but most cases are usually too extensive for surgery. Medications often used for treatment include oral steroids to reduce skin inflammation/itch, and chemotherapy, especially an oral drug called CCNU/Lomustine, which requires regular labwork monitoring to screen for possible effects on bone marrow and liver. Other combination chemotherapy treatment as for systemic lymphoma may be tried. Chemotherapy can cause partial or full remission of disease which may last for weeks to months. High dose linoleic acid (Hollywood brand safflower oil 3ml/kg with food daily) was found to be helpful in one small case report of 8 dogs but stomach upset and pancreatitis are possible side effects. Whole body electron beam radiation has been used effectively for a few patients but is very costly and usually only available at veterinary teaching hospitals. 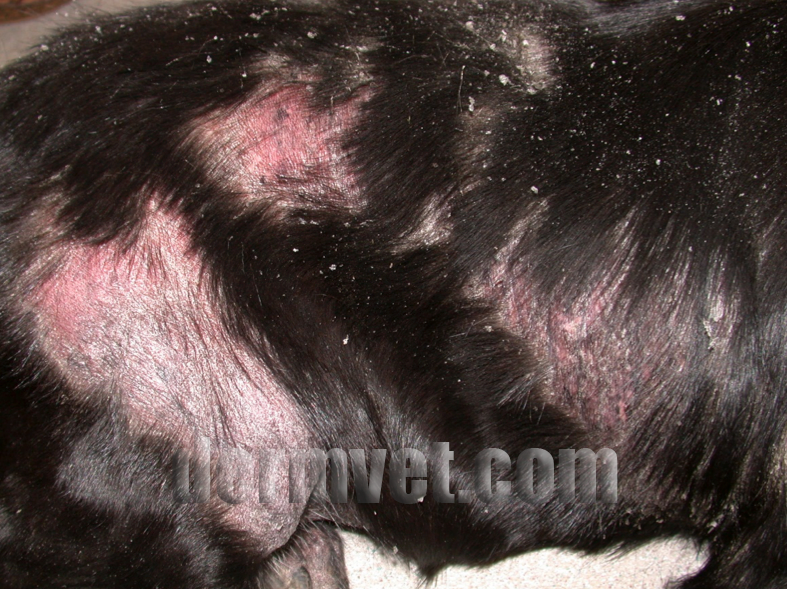 Retinoids (potent synthetic Vitamin A derivatives) or interferon-α injections are drugs used in humans and occasionally dogs with cutaneous lymphoma, but retinoids are very expensive and often difficult for veterinarians in the US to obtain. Recently, the caninized monoclonal antibody to IL31 called Cytopoint, an injection developed to help reduce itching due to allergies, has also been used to help reduce itching in dogs with cutaneous lymphoma. 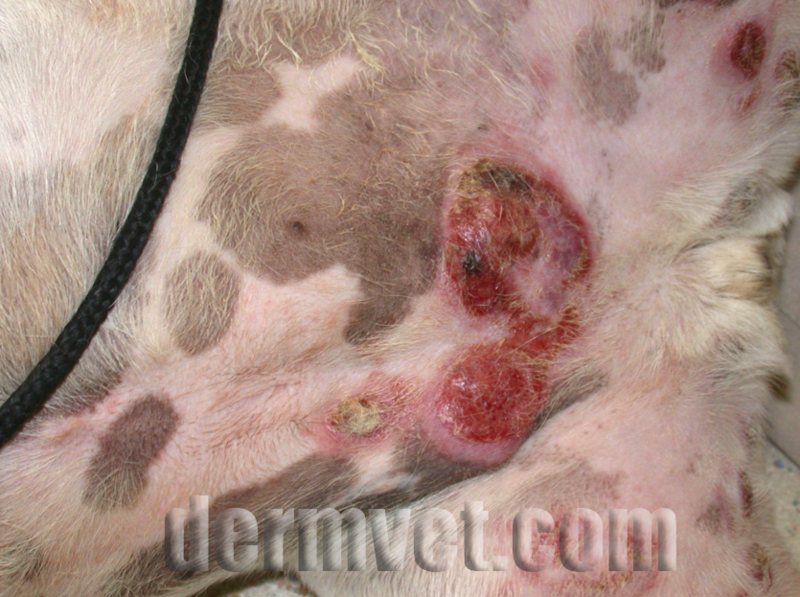 Other than in some dogs treated with whole body radiation, cure of cutaneous lymphoma is not possible, and the goal of treatment is to increase quality of life by reducing symptoms of itching/crusting for as long as possible. Prognosis: Unfortunately, the long term prognosis for cutaneous lymphoma is poor, and most dogs are euthanized due to progressive or refractory disease within months to sometimes up to 2 years after diagnosis.